We know how difficult it can be in colder months when bad weather or low temperatures spoil your hard-grown plants. But the temperamental British weather needn’t be an issue anymore. Greenhouses create the ideal environment for your crops to thrive throughout the year. Yet, with so many options available on the market, how to decide which greenhouse is the best? There are huge differences between apparently similar products and that’s why our gardening experts have tested and rated the seven most popular greenhouses for outdoor growing. Check out our top picks below. What are the best crops to grow in a greenhouse? What can you grow in a greenhouse in different seasons? Perfect for all year round outdoor growing – the polycarbonate panels ensure a great temperature control. 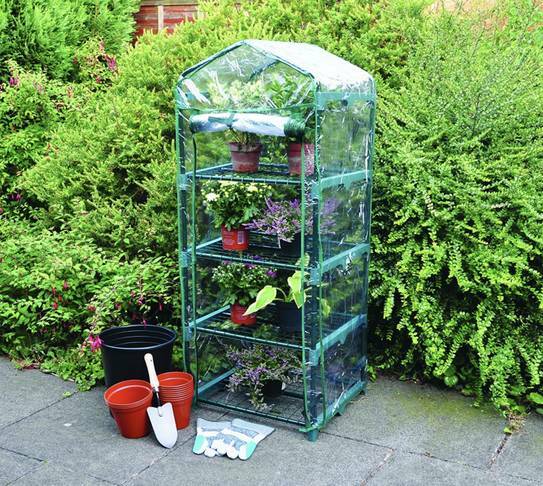 A portable and compact greenhouse – ideal for propagating seeds and starting a small garden. Great value for money! A very small and compact unit. This is a basic option similar to the Kingfisher, with minimal growing area but very low cost. Bulkier option that helps better protect against harsh British weather conditions. Has six shelves for round-year use. A walk-in option that offers plenty of space across two levels. Comes with a reinforced cover. Best for small-to-medium properties, large balconies and indoor use. Two large shelves on each side offer plenty of space. Looks great as a garden centre-piece but not recommended for growing plants. 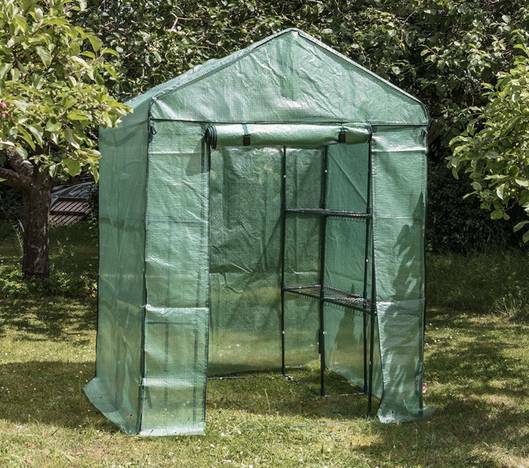 This greenhouse is ideal for all year round outdoor growing – it does an excellent job protecting the plants from low temperatures, and it comes with a virtually indestructible structure designed to last for a long time. The structure is made of a sturdy, rust-resistant aluminium frame and it has a galvanised steel base. The walls and roof are made of clear polycarbonate panels which allow over 90% light transmission, while the polycarbonate used is 100% UV protected. The panels won’t turn yellow over time and allow enough light to go through to let the plants thrive. Putting the greenhouse together is ridiculously easy. A step-by-step instruction manual provides comprehensive information on how to assemble the unit, while all panels have a uniform profile for a hassle-free match in the slots. The greenhouse has a footprint of 306x185cm and is 208cm high. This provides a generous growing area of 4.4m² and there is enough headroom for most people. Multiple accessories sold separately even allow the customisation of the interior, making the unit even more efficient and productive if you’re willing to spend a little extra. Clear polycarbonate panels protect the crops from low temperatures and elements, letting them thrive in all seasons. An included vent allows an easy temperature control and lets the plants enjoy fresh air. A hinged locked door is very effective in keeping pests away from your mini garden. The greenhouse resists to winds up to 75km/h and snow loads up to 100kg/m². The product comes with a 5-year limited manufacturer’s warranty. Although provided with a magnetic catch, the door could benefit from a brace to keep it closed. Condensation might be a problem in colder months. Kingfisher GHPRO is a compact and portable greenhouse that creates the perfect environment for growing potted vegetables, shrubs and flowers in a small garden or allotment. The mini greenhouse comes with 4 shelves of various weight capacity and it is covered with a transparent reinforced polyethylene cover. The transparent cover has a double functionality. On one hand, it lets the sun rays reach the plants promoting their development. On the other, it provides protection from bad weather and resistance to frost. This helps the crops grow strong and healthy regardless of the season. We were able to keep an eye on the progress of the plants thanks to the transparent cover, which was very helpful. The cover has a large front opening with zip fasteners on both sides while the flexible polyethylene is easy to roll up for easy access to the plants. In the warm season, this feature gives the functionality to let the plants enjoy direct sunlight and fresh air. To guarantee the robustness of the greenhouse but also to keep the structure lightweight and portable, the manufacturer engineered the frame in lightweight steel while the shelves are made of steel wire. Both the frame and the shelves are coated with a green epoxy powder that protects the steel from rust and provides durability to the product. We also appreciate how easy it is to assemble the product. Putting the greenhouse together requires less than 20 minutes and no tools, while the comprehensive instruction manual offers a wealth of information should they be needed. Perfect for propagating seeds and growing crops, the Kingfisher GHPRO boasts a generous weight capacity. The bottom shelf has a capacity of 15kg while each of the three upper shelves has a capacity of 10kg. Customising the inside of the greenhouse is easy and thanks to the removable shelves, the unit can accommodate fast-growing plants. Lightweight, portable, and compact, the greenhouse can easily fit in tiny spaces. The product is 50cm wide, 45cm deep, 130cm tall, and it weighs 3.5kg. Both the structure and the cover have an excellent resistance to wear and tear. The zipper closures also resist well over time. The structure doesn’t come with ground pegs or other tethering hardware. To accommodate fast growing plants, you will need to remove some shelves, as the distance between them is not adjustable. Songmics 3 Tier Mini Greenhouse is similar to the Kingfisher GHPRO in that it is a compact, lightweight and portable tier greenhouse. The similarities don’t end here but this product has only three tiers instead of four. The greenhouse is characterised by a stable and solid structure made of powder-coated steel tubes. On the other hand, the shelves are made of iron net and they have a little impact on the overall weight of the structure, yet they are solid enough to hold up to 25kg each. 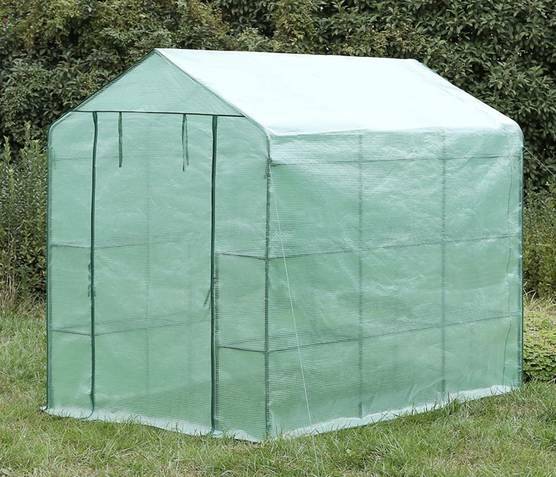 This structure is enclosed in a durable cover made of strong 140g/m² polyethylene. A useful characteristic of the cover is its internal green grid, that increases the strength of the polyethylene and prolongs its lifespan. The cover is also dust-proof, anti-UV screened and thick enough to protect the plants from frost. Although thick, the cover is flexible and provided with a convenient front rolling opening that can be tied at the top for easy access to the pots or closed with zippers to regulate the temperature. The cover attaches securely to the frame with four corner strings. A drawback of the product is the absence of ground pegs to secure the greenhouse which is lightweight and easily blown away by strong winds. The structure is very easy to assemble and the collapsible design ensures easy storage when the product is not in use. Versatility is added by the compact footprint. 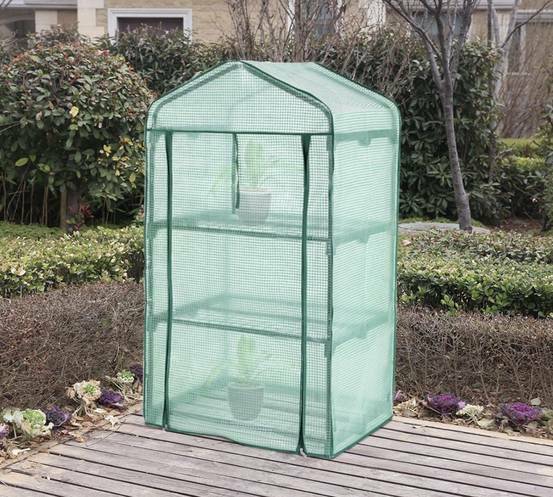 This greenhouse fits in small gardens or balconies and is suitable for indoor use. Easy access is ensured by a rolling curtain that can be fixed on the top with Velcro straps. The curtain is also provided with zipper closures. Strong winds might blow away the lightweight structure. Bulky when rolled up, the curtain might be annoying when accessing the top shelf. 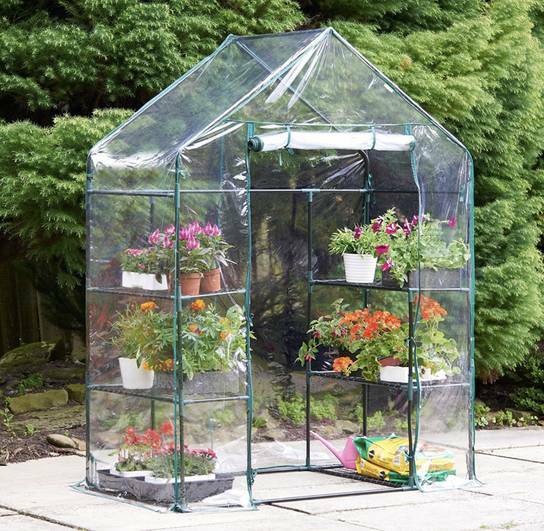 Designed to protect the plants from elements but ideal for a whole range of different purposes, the VonHaus Walk-In Greenhouse is big enough to accommodate plenty of plants yet compact enough to fit in almost all gardens or backyards of any size. Because of its larger footprint though, this unit is not exactly portable. The product has a strong frame made of powder-coated steel and is equipped with six removable wire shelves. Each shelf has a weight capacity of 8kg, for a total of 48kg. We admit that our expectations were higher, but the fabulous design counterweights this flaw. Another element that generates something of a love-and-hate sentiment is the PVC cover. We love it because it’s transparent, weather resistant and provided with a roll-up zip curtain that ensures easy access and sufficient ventilation. But we hate that it’s delicate and easy to rip. While there are replacement covers available, we believe it could have been made from a higher quality material. On a positive note, the greenhouse is easy to assemble and also easy to dismantle. Although delicate, the PVC cover does an excellent job protecting the plants from cold, pests, and weather elements. The greenhouse is suitable for continuous all year round use and even if bulkier than the models above, it still fits in most spaces. The greenhouse is 143cm wide, 73cm deep, and 193cm tall. The walk-in design protects you from rain or wind while watering or tending to your plants, which is awesome. The product comes with a 2-year manufacturer’s warranty. VonHaus Greenhouse is spacious enough to accommodate large pots, potting soil bags, and even gardening power tools. A simple push-together system allows an easy assembly and dismantling of the structure. Given its size, short people might have difficulties in putting the greenhouse together. The PVC cover is delicate. It rips off easily, birds can damage it and it has an overall poor quality. We would have liked the shelves to have supported a greater weight capacity. 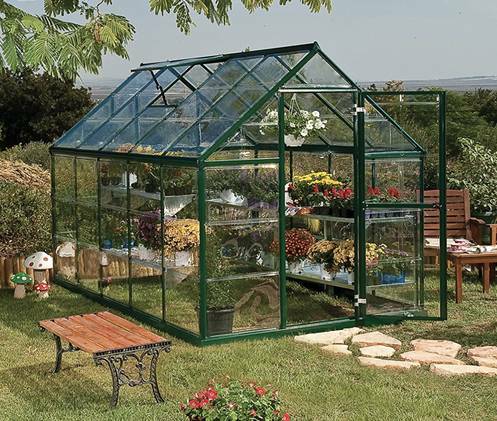 If space is not an issue, then the Harbour Housewares Greenhouse is an excellent product to consider. This walk-in unit boasts a spacious, double depth design that makes it possible to move freely and grow even more crops. The product has a sturdy steel structure; it comes with eight strong shelves and is equipped with a strong reinforced cover. The vertical design keeps the footprint somehow compact and makes the greenhouse portable, at least in theory. The product has a width of 144cm, a depth of 140cm and a height of 196cm. The internal structure of the unit is composed of two double racks, one on each side. The racks are disposed on two levels and offer a further ground storage space. Each level comprises two shelves placed one next to the other. The shelves measure 58x26cm and are made of sturdy metal wire coated with epoxy powders. Besides the generous internal space, the greenhouse has further features that differentiate it from the competition. It comes with a very sturdy reinforced cover with a rolling zipped front door. To further improve structural stability, the unit also comes with 16 reinforcing ground pegs with guy ropes that wind-proof the structure. The slot-together design allows assembling the greenhouse in minutes and with no tools. A convenient vent at the back of the structure controls the humidity. The product comes with 16 reinforcing ground pegs with guy ropes that increase the stability. 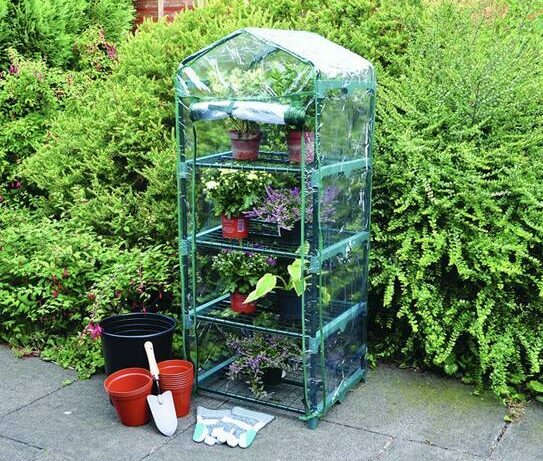 This greenhouse comes with 8 removable shelves, it has 12 side storage areas and a spacious entrance. The ground pegs might not be sturdy enough to secure the structure in areas with very heavy winds. The Songomics Grow House offers an exceptional price/quality ratio, and would be ideally placed in a small or medium-sized property, on a large balcony, or even indoors. Designed to prevent cold weather damage while providing sufficient sunlight to the plants, this product also protects the crops from insects, birds, and other pests. The unit boasts a solid structure made of powder-coated steel tubes with a diameter of 16mm and a thickness of 0.32mm. The structure is covered by a durable sheet made up of 140g/m² polyethylene reinforced with an internal green grid. Thanks to the thickness of the polyethylene, the greenhouse provides an exceptional protection from frost. Another thing we liked is the space-saving design of this unit. While the interior is spacious, the 3-layer design keeps the footprint compact. The unit is provided with two-layer mesh shelves on each side and each shelf has a weight capacity of 25kg. Furthermore, the unit has an outstanding stability ensured by the eight U-type ground pegs that secure the frame; at the same time, the cover is secured with four wind-proof pegs (one on each side) while a rope reinforcement ensures that the structure can withstand winds of up to 50km/h. The unit has a customisable structure with removable iron wire shelves; this allows the proliferation of fast-growing plants. A convenient front opening with zip fasteners provides easy access to the plants and helps regulate the temperature inside the structure. The cover is 10cm longer than the unit’s height, allowing you to place weights along the edges and improve the product’s stability. It is not possible to remove all wire shelves without compromising the stability of the structure. The polyethylene cover is very tight to fit and the rope that secures the wind pegs is short. It’s a hassle putting the cover on, closing it with zippers or tying it to the unit. Garden Igloo 33244 is a versatile greenhouse suitable for growing plants or creating a cosy outdoor area to enjoy all year round. Perfect to create a relaxing space, a covered Jacuzzi area or a children’s playground, this dome is a budget-friendly alternative to a conservatory and finds its place in all outdoor contexts, enhancing the curb appeal of a property. Inspired by traditional igloos, this product is built to withstand all weather elements and is very easy to install. Putting the item together requires about two hours and no tools while the comprehensive booklet provides easy to follow instructions. Once built, the unit has an amazing stability that can be increased by adding supplemental weights. 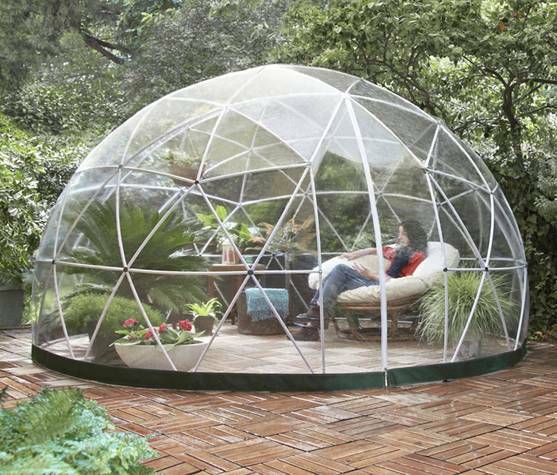 Regarding the size, the Garden Igloo has a diameter of 360cm, requiring a floor space of 360x360cm. But this means you’ll have plenty of space to grow plants or enjoy the beauty of your garden even in the colder seasons. Moreover, the greenhouse is also perfect to use in summer for multiple purposes. In fact, the manufacturer fabricates several types of covers for various seasons. The unit comes with a transparent cover ideal for winter use and there’s an additional polyester summer canopy available – designed to provide shade or act as a mosquito net cover during the hottest days, ensuring proper ventilation whilst simultaneously keeping the insects away. A downside of the greenhouse is the lack of shelving, while the dome structure makes it difficult to install any. Designed to withstand the elements, this greenhouse is a stylish addition to a garden or backyard and it can easily enhance the curb appeal of a property. The dome is multifunctional and suitable for both summer and winter use. It provides plenty of space to grow plants or enjoy the outdoors in all seasons. Installation requires little time and no tools. The unit has an excellent stability as a result of its rounded design. The dome shape makes it difficult to install shelves in the greenhouse. Probably not the best pick for growing. This unit doesn’t have a floor, which might be a downside in some cases. Growing crops is a greenhouse is rewarding, especially in the colder regions in the Northern UK. And although many edibles thrive in an unheated environment, we recommend investing in a product that allows the installation of a climate control unit if you want to keep harvesting even in the coldest winter months. That said, a small unit with no climate control still helps to prolong the gardening season – keeping your plants protected from harsh weather conditions and pests. Due to the rather cold British weather, some of the best crops to grow in a grow house are those that best tolerate low temperatures. Leafy greens, for example, thrive in unheated greenhouses as long as there is sufficient ventilation. We found that a small backyard product with a rolling curtain or vent offers the perfect conditions to propagate and grow leafy greens, such as lettuce, spinach, and kale. Summer crops thrive in grow houses as long as the temperature is steady. Most summer crops tolerate temperatures between 12°C and 29°C, and you can choose from tomatoes, peppers, cucumbers, aubergines, zucchini, summer squashes, and more. If you’re a beginner, we recommend starting greenhouse gardening with tomatoes. This versatile plant is easy to grow and there are over 10,000 varieties to choose from. Dwarf tomatoes prosper in small containers, while all other varieties can thrive in a large pot, raised bed, or square foot garden. Spring is the ideal season to start growing early summer crops. Sow your favourite vegetables in late winter or in early spring, either in sowing trays or in small pots. This will allow you to place the containers in your new structure, where the warm and moist environment favours germination and promotes a healthy development of the seedlings. You can always move them easily indoors if the temperatures drop significantly. There are few crops able to grow and reach their maturity in spring, but if you just can’t wait to harvest until summer, plant some micro-greens which can be harvested shortly after they germinate. Moreover, leafy greens, carrots, beets, and cabbage thrive in grow houses throughout the year and you can harvest the first crops as early as June. There are many warm season vegetables that thrive in a greenhouse during summer. A few examples include tomatoes, peppers, cucumbers, summer squashes, onions, and zucchini. Veggies apart, there are also many fruits you can grow. Melons, strawberries and raspberries are the easiest to grow, but there are many others to consider. We wouldn’t recommend sowing anything else than micro-greens in autumn, but in this season you can use your unit to ripe late summer crops and store your harvest. Onions and squashes can be stored in a grow house provided there is sufficient ventilation. Some herbs, such as rosemary, cilantro, and parsley also thrive in an indoor environment in autumn. Late winter is perfect for starting some crops. Some summer crops, such as raspberries and strawberries, grow healthier and have higher yields if exposed to frost. Edibles apart, there are many ornamental plants you can grow in a greenhouse all year round. Exotic plants, such as cacti, orchids, and even carnivorous plants thrive in grow houses in summer but should be moved in a warm indoor environment in the coldest seasons. In winter, you can use an unheated grow house to keep outdoor ornamental plants such as pansies, poinsettias, petunias, chrysanthemums, and ferns.